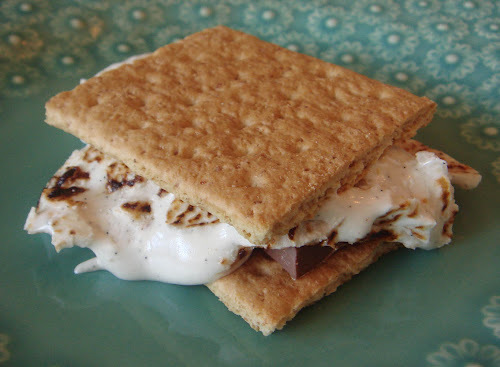 You may remember that my friend, Anita, and I made homemade s'mores with marshmallows and graham crackers from scratch in a past post. But this time, after a long a day of work, we still wanted some gooey s'more goodness without starting from scratch. For Anita's birthday, I gave her a S'mores cookbook which we can't wait to try out for future posts. (Confession, I totally wanted this book for myself once I saw it!). And so in giving her the book, we just had to have some ourselves for dessert that night. But, rather than using the usual store bought jet-puffed marshmallows, we upgraded to these "very vanilla bean, hand crafted" marshmallows from Whole Foods. Look for them in the bakery not the grocery aisle. We stuck to the usual graham crackers, although I gave Anita a box of bakery graham crackers from WF for her future recipes- much more rich and buttery like the homemade ones. For the toasting, we simply used our gas stove. 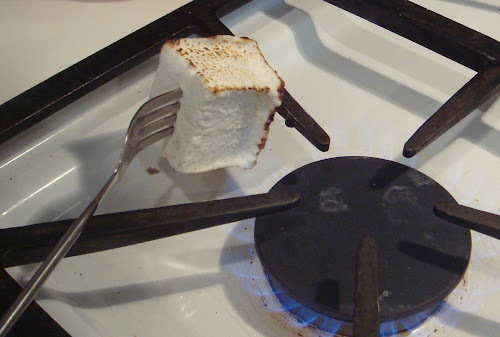 If you have a gas grill or a charcoal grill, that's great too but for indoor s'mores, using the stove wasn't a bad alternative. 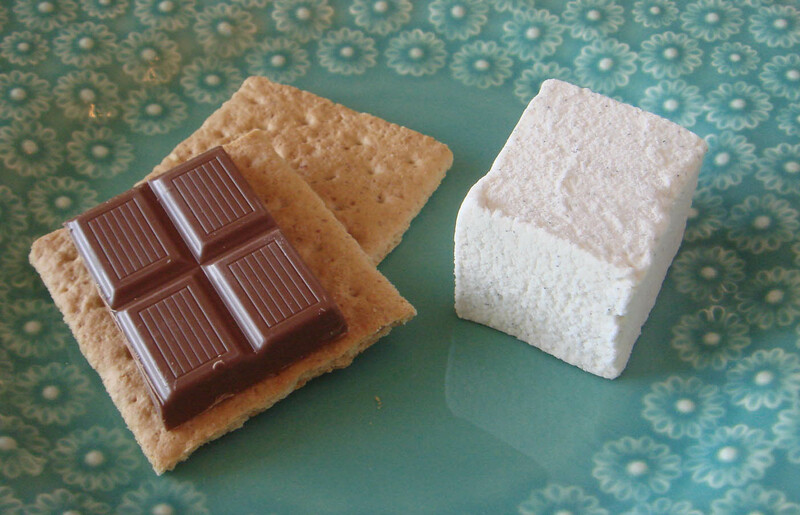 Once the marshmallow was sufficiently toasted, it went onto a square of Swiss Milk Chocolate. 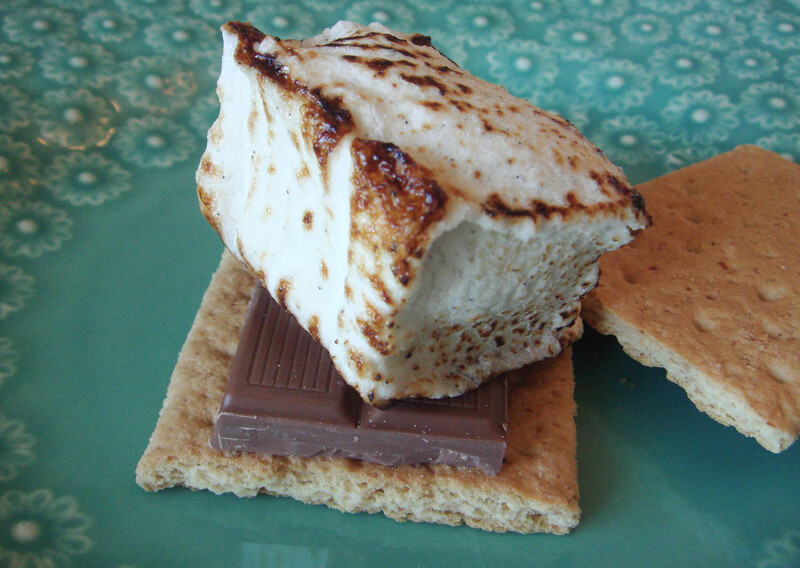 And with a ceremonious squish, this indoor s'more was made! And it was delicious! So, whether you have time to make s'mores from scratch or you want to shortcut to a s'mores sweet treat, we think it's worth the splurge. the S'mores look great-they do... BUT, I can't help but love the nostalgic taste of a S'more made with Hershey Chocolate, Kraft Marshmallow and Maid (or whatever that brand is) Graham crackers. The flavor is 100% the 70's and brings me back to summer camping with my couisns circa 1976! I love remaking a classic in a upscale gourmet way, but for true flashbacks to a time and place (and these days food has to have a voice right!) its gotta be the real deal, food scientist made, non organic, probably HFCS in there, cheap chocolate from the Hershey planation in Hershey, Pennsylvania! The Bun Is Out of the Oven!